Fulfilling a 500 year old Prophecy the Eagle and Condor are coming together. This is the video of the Condor Dance at the “Return of the Ancestors” gathering in Tuba City. For this gathering the Condor dancers from Peru danced in front of Don Alejandro, the Mayan High Priest, and the Hopi elder Grandfather Martin. 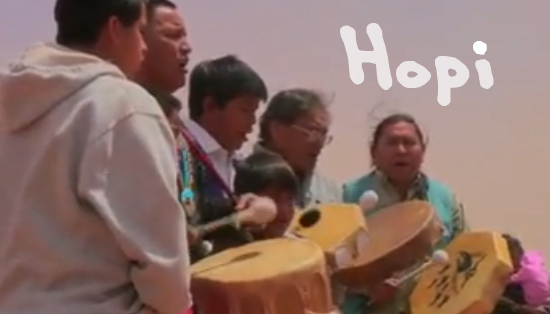 Hopi singers responded to this dance in song for the guests from all over the world. The Incas traveled from Peru to come to the Gathering of Ancestors and share the Condor Dance. The feathers from the Condor wings are 5 generations old. This was the last time they will be used in the dance as their mission has been fulfilled. They have come to North American and met their “cousins”. This was a very moving day on Hopi/Navajo Land. Everyone felt the emotion and how special the moment was.